Washington, D.C. - The 12th U.S.-Sri Lanka Trade and Investment Framework (TIFA) Council meeting was held April 28, 2016 in Washington, DC. The meeting was Co-chaired by United States Trade Representative Michael Froman and Sri Lanka Minister of Development Strategies and International Trade Malik Samarawickrama. United States Permanent Representative to the United Nations Ambassador Samantha Power participated as well, encouraging the Sri Lankan government to continue its vital progress on democracy, accountability, and human rights. 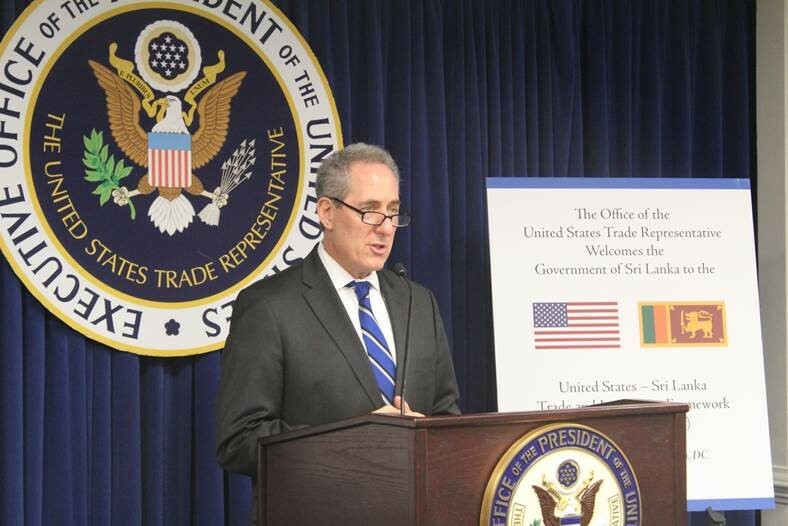 Ambassador Froman noted that the election outcome has ushered in a new era of U.S.-Sri Lanka economic cooperation. In this spirit, with a goal of significantly increasing two-way trade and investment between the United States and Sri Lanka, the two governments adopted a U.S.-Sri Lanka Joint Action Plan to Boost Trade and Investment. Both sides affirmed their belief that the bilateral trade and investment relationship has great potential that can be realized through adoption of enabling policies and joint measures incorporated in the Plan. The Joint Action Plan aims at reaching its goals over a span of five years; its objectives include, among other measures: reforming Sri Lanka’s trade and investment regime to world class standards; improving the competitiveness of Sri Lanka’s current exports; developing new markets, especially those that take advantage of Sri Lanka’s status as a regional services hub; promoting greater interaction between the U.S. and Sri Lankan business communities; greater utilization of U.S. tariff preference arrangements; strengthening of worker rights and promotion of ethical and environmentally sustainable manufacturing practices, especially in Sri Lanka’s RMG sector; reforming the educational sector to make it more responsive to the needs of business; and increased mobilization of all sectors of society, especially women, in business and trade. During the meeting, the Sri Lanka delegation, building upon the Joint Statement of the recently concluded inaugural “Partnership Dialogue” between the two countries, presented several specific proposals for deeper cooperation to enhance bilateral trade and investment and improve the overall competitiveness of Sri Lanka’s economy. Both governments pledged their commitment to deepening their engagement over the coming months in order to develop a detailed implementation plan for the Action Plan, with formal launch envisaged later this year.